The Girls final was an entertaining affair eventually won 73-63 by favourites Westlake Girls High School after Rangitoto College had pushed them all the way. Tiarna Clarke opened proceedings as Westlake shot out to an early 8-0 lead. 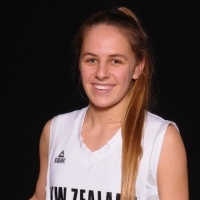 NZ Under 17 international Coola Baudry put Rangitoto College on the board but her team trailed 17-11 at the end of quarter one. Westlake welcomed centre Katelyn Noyer back into their line up following injury and she produced a couple of emphatic blocks in the opening stages of the second quarter. Steals and baskets from Zara Jillings and Rosie Davison threatened to take the game away from Rangi but a nice drive and dish from Rebecca Hughes for another Baudry basket kept the scoreline manageable from their perspective, trailing 36-24 at half time. The two best forwards on show, Baudry and Noyer, demonstrated some nice inside footwork as they exchanged baskets in the third period. Annaline Crosbie and Casey McFadden scored back-to-back threes before Clarke nailed a triple of her own to keep Rangi at bay. The quarter closed with a trademark step back jumper from Sophie Bond as Rangi sensed an opportunity, trailing 58-52 at the end of the third period. Westlake coach Justine Reed was forced to juggle her resources, as Noyer, Jillings and Olivia Bell were all called for their fourth fouls by mid term in the final stanza. Active defence from Rangi and a nice inside basket from Baudry had the Westlake team looking anxiously over their shoulders only ahead 66-60 with 3:10 to play. On the next Lake possession the rather subdued Clarke sunk a long range triple and as hard as they tried Rangitoto could not get closer, a Davison steal and lay up sealing the title for Westlake.